‘I hate you, Peter,’ said Lady Mary. The Duke of Denver, Lord Peter's brother, has been accused of the murder of a house guest. He has no alibi and his statements are so contradictory that it really looks like he is in danger of being found guilty. Luckily for him, Mr. Bunter, Lord Peter's valet, has managed to find a current edition of the Times while with Peter in Corsica and promptly arranges for Peter's return to the family home. All I can say is that this book is even better on the second read. On the first read, I was so involved in the solving the mystery of who killed Cathcart, that I didn't appreciate the all of the snippets of humour and wit that are strewn throughout this novel. Well, I did appreciate them, but not as much as I should have. This book is a hoot. 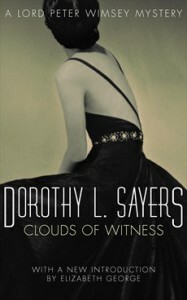 But it is not just fun that makes me love the Wimsey clan. I also love the interaction between the characters - whether it is Bunter looking after Wimsey, Lady Mary stropping with Wimsey, Wimsey egging on poor love-sick Parker, or the Duchess calling them all to order. And best of all, there is such a lovely spirit of the hopefulness and modernism of the 1920s in this. I really like this book and am so glad that I didn't stop reading this series after the disappointment that was Whose Body?. ‘I think we may say we have made some progress,’ said Parker. ‘If only negatively,’ added Peter.